We received complimentary tickets to attend the 30th anniversary of the Bristol Renaissance Faire in 2017. 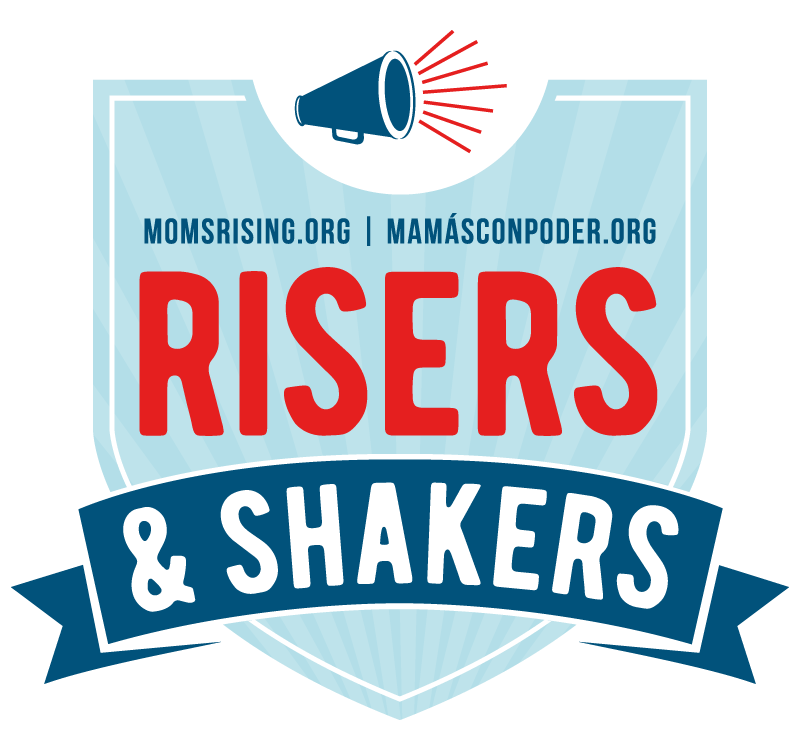 We were thrilled to work with them after attending the previous year on our own. All thoughts shared are our own. Whether you consider yourself a little bit geeky or not, I highly recommend transporting yourself to the Bristol Renaissance Faire. In fact, I'm bummed that last year was my first time going! I felt so comfortable there and thoroughly enjoyed the experience. For years, I'd heard about it, but wasn't sure if it was my thing. Well, it was totally my thing. But was it for kids? I figured Brian and I would have fun browsing and eating (because fair food), but I wasn't sure if there was enough for the kids to do. So, if you have been on the fence about going, I'm here to tell you that it's fun for all ages! It's pretty easy to convince kids to dress up in costumes, so this one is kind of a given. Not everyone who attends gets into character, but this is a fantastic thing to do as a family. Not sure how to dress up? Check out the weekend themes for inspiration, but mostly choose what you are comfortable with wearing while walking around. You will see a wide variety of costumes – from elaborate, handmade ones to more simple outfits. The only limit is your imagination! The first time we attended Ren Faire, my daughter dressed up like a princess and I purchased custom fit elf ears. So, this year, she dressed like a fairy, and I dressed normal except my ears. Each time we're there, I add something new to my cosplay wardrobe. I'd love to plan and coordinate our family costumes, but so far we just do our own individual thing. Oh, and if you want to dress up but don't have a clue where to start – you can rent a costume right at the fair! One of my favorite things to do is admire other people's costumes. At times it may be hard to tell cast members and guests apart because even some guests really get into character. It's fun to watch as a woodland faerie flutters about or as a scalawag of a cast member pretends to stalk and pickpocket unsuspecting guests as they walk by. The cast are delightful to interact with as well and I highly encourage it (as long as it is not interrupting their schedule). While waiting in line, we met someone named Raven who kept us entertained with magic tricks. The kids were also fascinated by the woman statue who moved when offered coins. There are lots of opportunities for you and your family to feel part of the fantasy world you stepped into rather than merely an observer. There is plenty of entertainment – some in grassy areas, others upon a stage. When we arrived, we witnessed a fantastic group sword fight. You can watch jousting, listen to a roaming family of musicians, see a fire whip, and more. The Bristol Renaissance Faire is open rain or shine. We've always experienced lovely warm weather, but we hear there are special shows you can only catch if it rains. Check out descriptions of all the entertainment here. This is the perfect time to add to your cosplay. There are vendors for steampunk, pirates, wizard robes, and more. You'll find flower crowns, kids toys, and even a store dedicated to fairies. Last year, we let my son pick out a wooden sword and shield from one of the shops. It's held up well! You could easily spend one day browsing shops. Pro tip: The Bristol Renaissance Faire shop near the entrance and exit can hold purchases for you until you leave. You'll find some of your typical fair food, but usually with a medieval twist. There are some more kid-friendly options near Kid's Kingdom, such as Dragon Tails (mac and cheese bites). You'll also find brats, portabella mushrooms, turkey legs, corn, steak on a stake, and more! You cannot bring food in, but you can leave and get your hand stamped for re-entry if you'd prefer to pack a picnic in the car. This is actually a great option if you are on a budget or prefer to spend money on treats and snacks rather than a full meal. If you get the frozen fruit, I suggest trying the strawberry inside an orange! This is always a hit with my daughter. 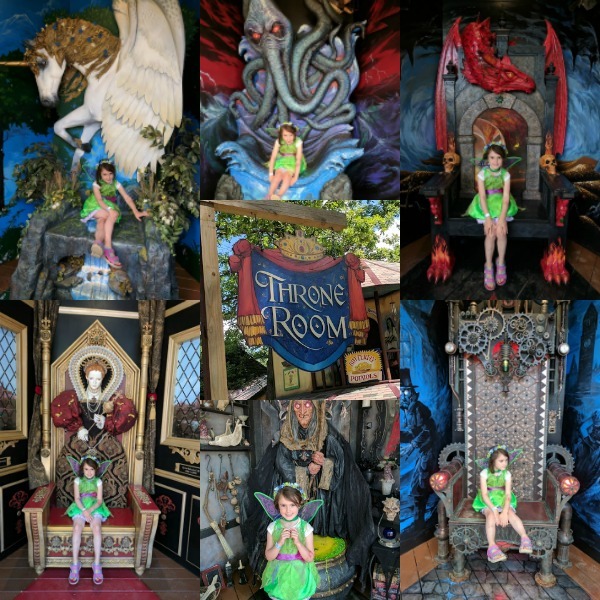 They have beautifully detailed thrones perfect for photo opps (and some quite terrifying ones). All are well done and this year they had some new ones. They try to keep the line flowing and organized in order to give everyone a turn at each throne which I greatly appreciate. Your family has been transported into the past and there is no such thing as electricity. All rides are human powered! Last year the kids enjoyed a ride on the butterfly carousel. I was interested in watching how the rides worked. If you are seeking more thrills, there are a few modern options with themed names. The games are simple, yet fun. We always stop for the treasure dig. It's a low cost activity that keeps the kids entertained for awhile so you can relax for a moment. I suggest grabbing a cold beverage before making your way there. Let the kids see what they can dig up for 10 minutes (they will easily be entertained for at least that long). Once they decide upon a treasure to keep, they have to help bury everything else. 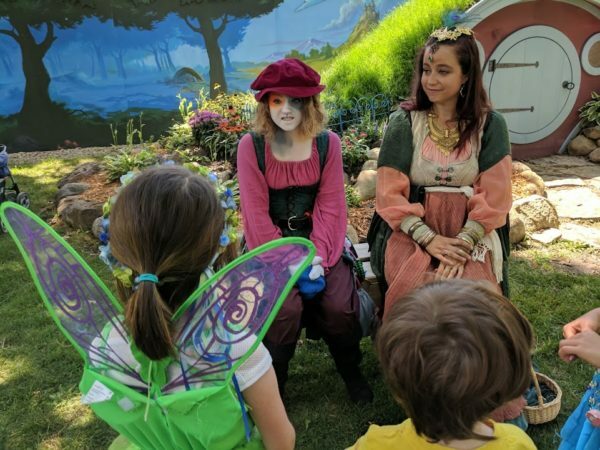 You may have heard of RenQuest, which is the live action role playing quest for adults at the Bristol Renaissance Faire, but did you know they have one for kids? The overall quest this year was similar to last year, but the adventure along the way varies. 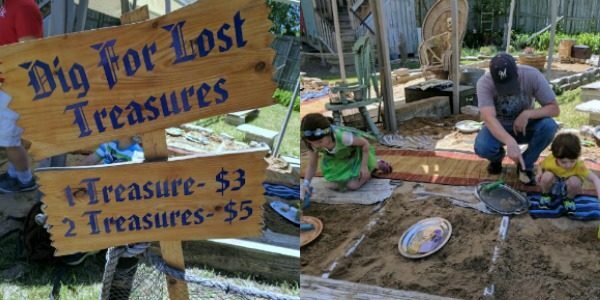 Sign your little adventurer up at the same place as RenQuest. After getting your wristband, head over to Kids' Kingdom near the red Hobbity house. (You'll know what I mean when you get there.) You may need to approach a cast member in the area to let them know your child is on a quest. They will get you started. Please note it can take awhile to complete the quest, especially if one of the cast members you are searching for is difficult to find. You may need to help promote your little one throughout their adventure, unless they are very comfortable approaching new people and striking up a conversation. They will be required to complete little tasks, such as learning a dance or playing a game with another cast member. KidsQuest is $5 per child. Do the kids need to run around and burn off energy? Take them to Kids' Kingdom! There is a pirate ship they can climb and a slide. My kids love this area, but it can get crowded. Pro tip: Dress your kids in bright colors to make them easier to spot! Be sure to check the schedule too, because they have different activities throughout the day that the kids can participate in, such as a treasure hunt. We have not timed it right for the kids to be knighted by Queen Elizabeth yet, but this would be something to do! When Queen Elizabeth comes to town, she comes in style. You have to watch the parade at least once as her majesty travels through the fair. There are interesting costumes and characters and music which keep your attention. Plus, everyone wants to glimpse the Queen and wave at her! The Ren Faire is open Saturdays and Sundays throughout the summer. Opening weekend takes place after the Fourth of July holiday and wraps up Labor Day Weekend. Be sure to check out the hours and weekend themes! You may purchase your Bristol Renaissance Faire tickets online or at the door. Kids 4 and under are free. For even MORE things to do, be sure to check out the Queen's College for free classes and workshops such as basket weaving, candle making, calligraphy, and much more. 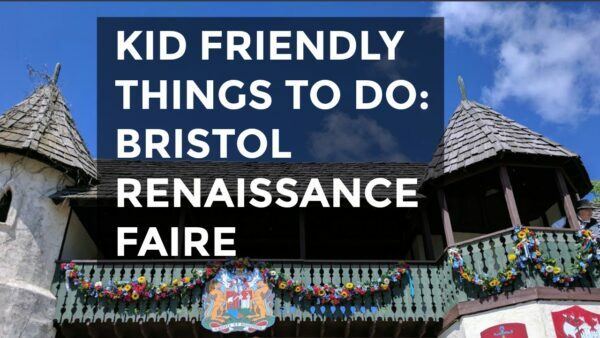 We hope these ideas of kid-friendly things to do at the Bristol Renaissance Faire helps you plan a fun family outing. You may not be able to do all of them in one trip, so pick a couple must-dos and have fun! This looks like such a fabulous time. I am all about going to a renaissance faire some day, I know the kids would have a blast based on reading this. Thanks for sharing your experience. I hope you get the opportunity to visit one in the near future! I have always wanted to visit a renassance faire! It seems like so much fun, and with all of these great kids options, we will have to plan to bring my daughter! If you can spend a day there, I highly recommend it! I’ve always loves renaissance faires. They are so much fun! The pageantry and they way the participants stay in character is such an amazing experience. The people who work there are incredibly talented. Thank you for checking out our list! I’ve been to a couple of Renaissance faires and it’s always so much fun. The people who perform there are so dedicated! This reminds me to see when the next one is in my area. The cast members are talented. I’m not sure I could stay in character like that and improvise based on interacting with guests! Wow, that is a really great list. So many fun things to do! I would love to take my daughter! Thanks, Mistee! I bet your daughter would have a blast. Great tips. This looks like so much fun. I wish I had younger kids. I told my youngest who is 16 that I wanted to go and wear fairy wings and she looked at me like I was crazy. I definitely want to go one day.